Dubai: As Jebel Ali Racecourse prepares to stage its final meeting of the 2018-2019 UAE racing season on Friday, a senior patron has called attention to the benefits of horses competing at the popular venue. Speaking on behalf of Shaikh Hamdan Bin Rashid Al Maktoum, Deputy Ruler of Dubai and Minister of Finance, Mirza Al Sayegh, the long-serving director of his office, said: “Shaikh Hamdan is pleased that Jebel Ali Racecourse has once more made a significant impact on UAE racing during the season. The Jebel Ali Sprint in particular is a race that has produced two winners of the $2.5 million Dubai Golden Shaheen, sponsored by Gulf News, with State City in 2003 and Muarrab in 2016. “Muarrab is a classic example of a horse who won at Jebel Ali and went on to win one of the big sprint races on Dubai World Cup night,” Al Sayegh pointed out. Muarrab is owned by Shaikh Hamdan, who also owns Thammin, winner of the 2019 Jebel Ali Sprint who is awaiting an invitation to the Golden Shaheen on March 30 at Meydan. Jebel Ali Racecourse, which was built in 1990 following the instructions of Major General Shaikh Ahmad Bin Rashid Al Maktoum, Deputy Chief of Dubai Police and Public Security, has staged ten meetings this season. Friday’s final meeting is the second biggest of the season and is highlighted by the Jebel Ali Classic (Silver Jubilee), sponsored by Shadwell. A strong field of 13, many of the horses confirmed course specialists, will vie for a purse of Dh300,000. The supporting feature, the Derrinstown Stud-sponsored Conditions event, has drawn a quality field of eight runners. Yasir Mabrouk, representing the Emirates Racing Authority (ERA), commended Jebel Ali Racecourse on hosting a landmark season. “This has, without doubt, been the best season ever at Jebel Ali,” he said. 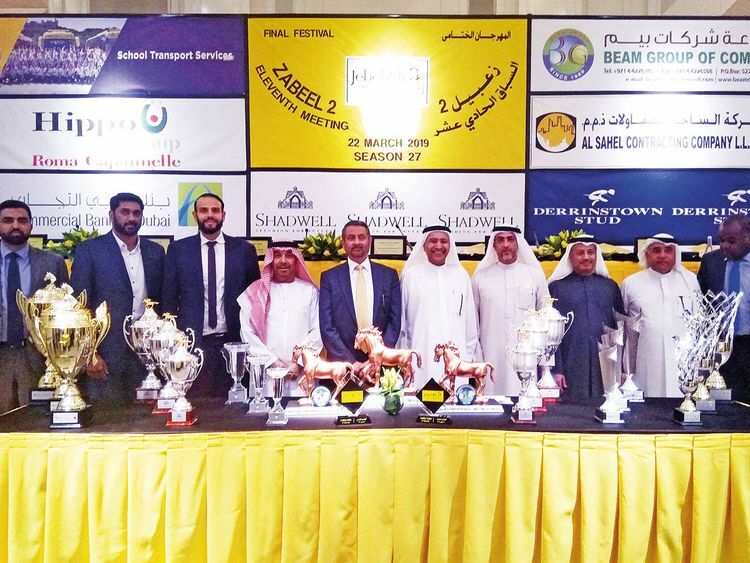 “The quality of racing, the number of runners on average and the closeness of the competition has all served to showcase the strength of Jebel Ali Racing. “It’s hard to pinpoint any one highlight as each and every meeting has had its share of uniqueness. I believed that the close partnership between the ERA and the Jebel Ali management has ticked all the right boxes and resulted in a memorable season,” Mabrouk added.